1. Cut out the center of the paper plate, leaving about a two-inch rim. Paint or use markers to make the wreath black then let dry completely. For the fun foam, cut a large circle out of black fun foam then cut a smaller circle out of the middle. 2. 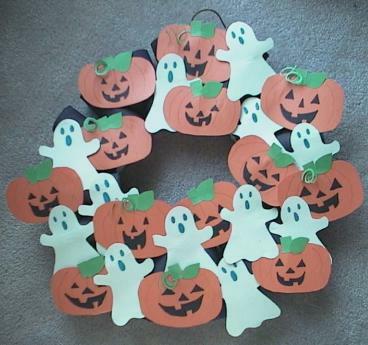 Cut out shapes to put on the wreath — leaves, acorns, gourds, pumpkins, bats, ghosts, turkeys, cornucopias, feathers, hay bales, corn stalks, etc. Decorate them however you'd like. 3. Glue the shapes around the rim of the circle, overlapping as needed to cover the rim. Let dry completely.